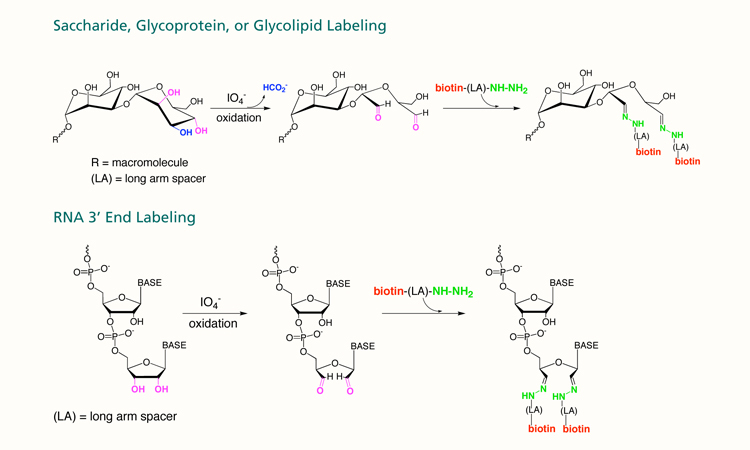 Biotin (Long Arm) Hydrazide (SP-1100) reacts with aldehyde groups and thus can be used to label carbohydrate groups present in a wide variety of macromolecules. The spacer arm in this product allows optimal accessibility of avidin or streptavidin conjugates to biotin. Biotin can be incorporated into viruses, bacteria, or animal and plant cells via their surface carbohydrate groups. Incorporation of Biotin (Long Arm) Hydrazide occurs onto sugars containing unsubstituted vicinal hydroxyl groups that are usually present at the non-reducing termini of the oligosaccharide. A brief treatment of the saccharide with periodate (not included) produces aldehyde groups on the sugars containing unsubstituted vicinal hydroxyl groups. Biotin (Long Arm) Hydrazide reacts with the aldehyde groups, producing a stable linkage between the saccharide and biotin. Mild oxidation of the ribose located at the 3' end of RNA, the only ribose susceptible to periodate oxidation. The bond between the 2 and 3 hydroxyl groups on the ribose is cleaved, generating two aldehyde groups. Reaction of both aldehyde groups with Biotin (Long Arm) Hydrazide, introducing two biotins at the 3 end. 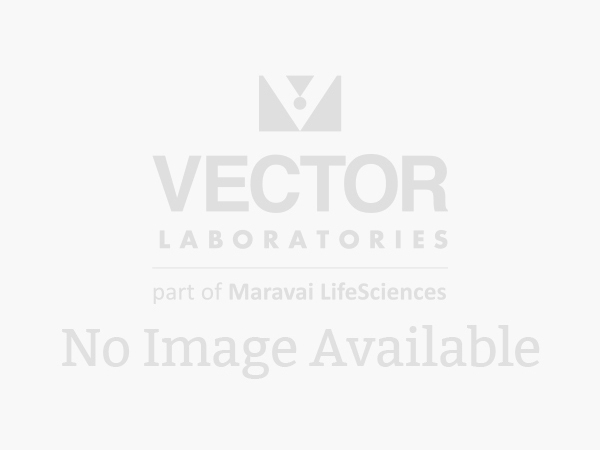 This reagent can also be used to couple biotin to carboxyl groups on proteins and other molecules using a carbodiimide coupling method. Initial activation of a material such as plastics with glutaraldehyde allows subsequent incorporation of Biotin (Long Arm) Hydrazide onto the surface.